The advent of the 21st century has led to several technological advancements especially in the mobile phone manufacturing sector leading to the production of smartphones boasting several features including GPS tracking, Cloud Storage, Data Encryption and others. With the advancement in mobile technology, there however remains some key issues of security and protection of data warranting the use of some parental control applications which are useful in spying on specific smartphones be it in the workplace or on kids at home. One of such iPhone spy apps is iKeyMonitor which proves a great deal of advantages especially in the office space as it helps employers monitor online activities of their employees on corporate networks in order to increase both their efficiency and effectiveness at work while limiting access to distracting web contents and applications. Additionally, iKeyMonitor iPhone spy app also proves useful in monitoring and limiting your child’s access to certain online contents which may be harmful. Why Use iPhone Spy App? Either in a young and budding corporate environment or in a well-established company setting, one of the main management goals is to get work done. However, employees’ unlimited access to the Internet may prove to be a major deviation to the company’s goals as an increasing number of employees have admitted to being distracted from their work by web contents which rather occupies their work time. This is especially obvious among employees who use the company-offered cellphones for work. This major detriment which accompanies provision of internet facilities may however be overcome with the use of the iPhone spy app which enables employers to monitor employees’ activities. Additionally, the iPhone spy app could also be a great tool in monitoring kids’ online activities and keeping their safety. Presence and access to contents with the addition of an up-to-date tracking feature which is embedded as part of the application. Many parents have to work and may not be able to watch children’s activities in person. With a professional iPhone spy app, parents can remotely watch children’s mobile activities. iKeyMonitor iPhone spy app monitors text messages across several platforms on the tracked smartphone. Monitored messages include: SMS messages, iMessages, WhatsApp messages, Viber, QQ, Kik, Facebook, Instagram, Line, Snapchat, Skype, WeChat messages and others. iKeyMonitor iPhone spy app also keeps track of voice messages sent and received in Facebook Messenger, WhatsApp, Viber, Line, KakaoTalk Voice, WeChat, QQ. iKeyMonitor keeps log of phone history including call history, keystrokes typed, contacts and reminders, clipboard logs and others. If your children get addicted to social apps like Facebook or games, you can use iKeyMonitor to block these apps absolutely or only allow them to use these apps for limited time. The feature of screenshots capturing can catch almost anything on the target device which even cannot be recorded by keystrokes, such as emoticons and stickers, videos watched. 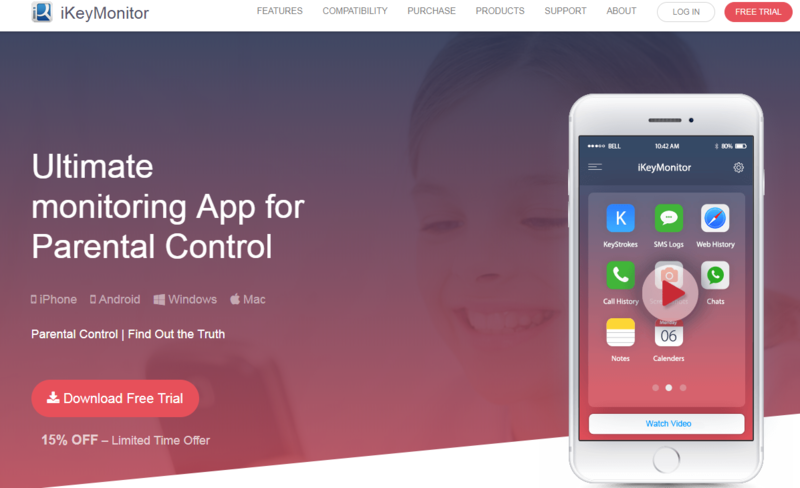 How to Set up iKeyMonitor Parental Control App? Setup the details and start spying. iKeyMonitor offers a 3-day free trial version so that users can test the features before purchasing the full-featured version. Based on the need of parental control or employee monitoring on iPhone, users can choose the monthly plan ($49.99 per month) or the yearly plan ($299 per year). iKeyMonitor iPhone spy app provides a 30-day money back guarantee to users in the event the support staff are unable to solve technical issues arising from the use of the iPhone spy app.